Hello, so to start the new year and share my new series of crafty goodness I have for you a cute and easy tag/ embellishment I made as a shout out to my friends over at Sin City Stamps. 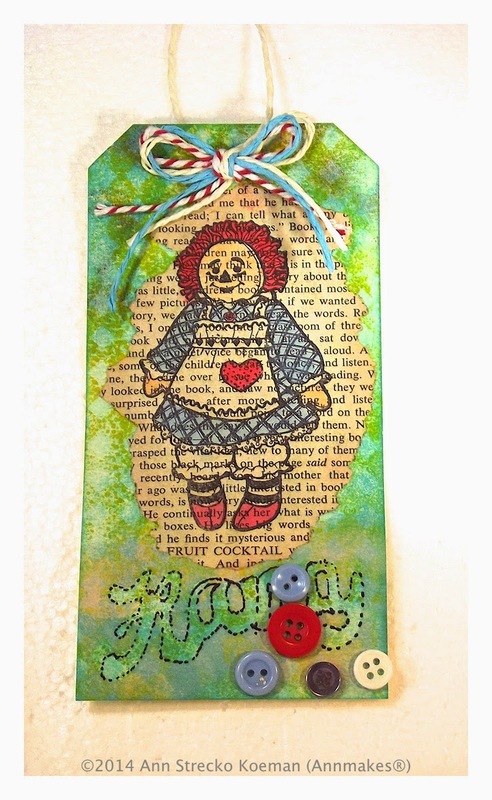 Of course I just love anything with the iconic rag doll as we share the same name and I loved dolls as a little girl. To be honest I still do. To make this I used the supplies listed below. Tim Holtz Distress Inks by Ranger in: Peacock feathers, Mustard seed, and Spun sugar. Caran D'Ache Neocolor II® watercolor crayons. 1. 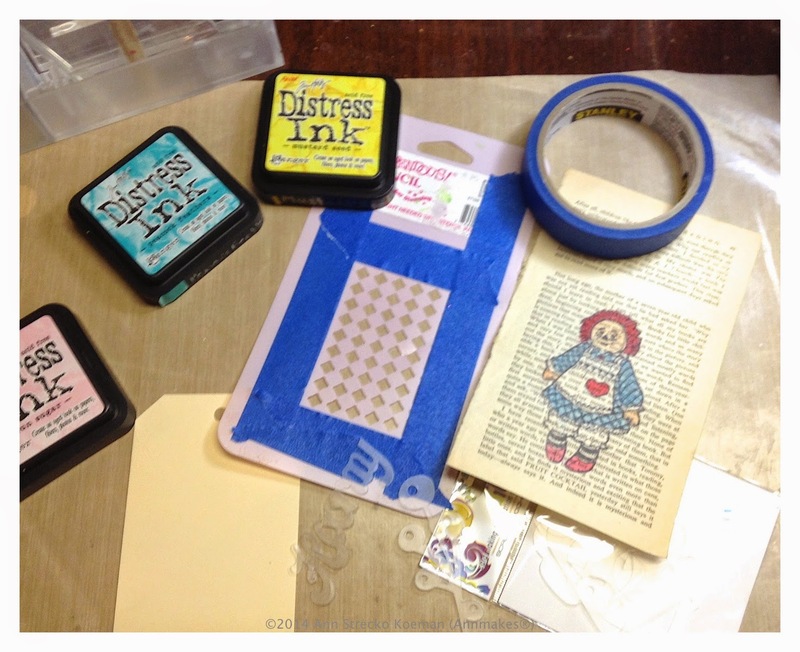 Using the Distress inks and some sponges or daubers apply the ink using the stencil. Overlay the mask and continue inking. Adding colour randomly. Remove mask and stencil. Let dry. 2. On a piece of an old book page stamp the image using StazOn. Let dry completely. I used this permanent solvent ink so that the water colors would not run when applied. 3. Rub chosen colors of watercolour crayons on a plastic palette. With a damp paint brush pick up colors off palette and color in image one color at a time. Making sure to clean the brush in between colors. Let dry. 4. 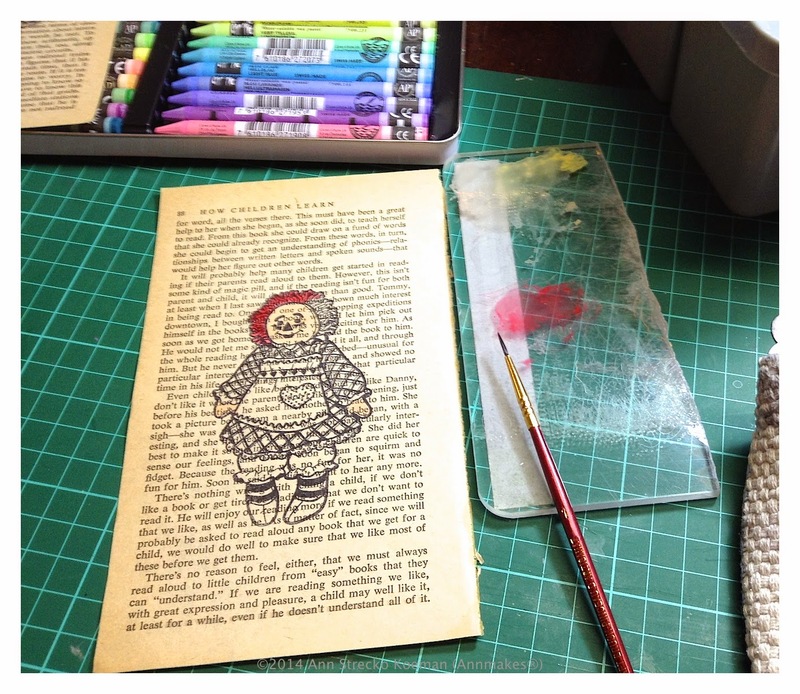 Tear around the coloured stamped image, ink the edges. Once dry glue to tag with some glue and coat with a sealer such as Mod Podge. 5. Using a black pen add stitching lines around word Hooray (that was mask). Glue on some buttons and attach twines. For a great place for beautiful products to use in your own crafty endeavours go check out my friends at Sin City Stamps. Thank you so much for stopping by today. Come back soon to see what else I am up to.